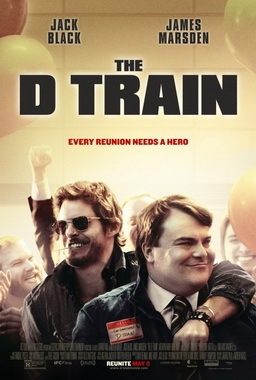 Jack Black makes a departure from his usual zany characters here to play everyman, Dan Landsman, the self-appointed head of his high school class’s twentieth anniversary reunion committee. Together with a motley crew of one time geeks and dorks, he attempts to fuel interest in the event to no avail. However, when he sees former jock and the most popular guy in the school, Oliver Lawless (Marsden) in a commercial, he decides to try and use him to attract a crowd. Lying to his boss in order to get to LA where Oliver is based, he reconnects with his former school mate. However, all is not as it seems with Oliver, and after one very drunken night, Dan finds himself in bed with the handsome actor. Committed to getting him to attend the reunion, he is forced to supress his secret, while trying to figure out a way to keep Oliver out of his life. Black may have toned down the zaniness, but this is still as puerile as most of his other work, with a hefty dose of homophobia thrown in for good measure. The extent of Dan’s self-loathing after his man on man encounter is completely OTT, and the language he uses to convey this is quite often extremely offensive. Tthe jokes are smutty, and the script is weak, and the plot seems to just amble along. Black is good as Landsman, and Marsden refreshingly doesn’t take himself too seriously as the handsome and vain Oliver, however, they have very little chemistry. I did find myself wondering why Marsden would even accept this role, and all I can think of is that he was looking for a departure. In trying to make a statement about how events in High School or Secondary School can shape us for life, the writing|directing duo, Paul and Mogel, have resorted to cheap laughs and stereotypes, rather than a serious social commentary. Reunion pictures always give a great opportunity to get retrospective with the characters, but that is wasted here, in favour of the “shock” twist. By the end of the movie, you don’t even care if Dan’s wife and family find out, since the whole thing has been hyped to hysterical proportions by Black. This was pulled from 847 theatres in its second week in the US, and I can’t see it enjoying a long run here either. One for the diehard Jack Black fans only.